A chicken and bean casserole that is easy to make, super-delicious and kind to your waistline – I love it! This is a much mellower dish compared to the spicy Asian-style food that I often cook. But it still delivers on flavour – just in a softer way. To make this an as low-calorie and healthy dish as possible, don’t fry the chicken beforehand and serve it together with additional vegetables such as roasted carrots and pumpkin and steamed/boiled green vegetables. Or simply serve it with a big mixed salad. 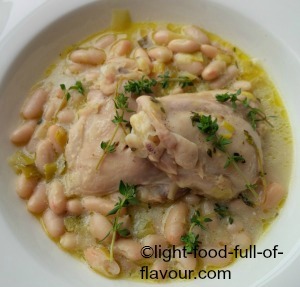 I am using cannellini beans in this chicken and bean casserole. I admit that I buy my beans in tins/cans rather than cook them from scratch but I usually buy an organic variety – which I sometimes find in well-stocked supermarkets, or in health food shops. Beans in general are low in fat and saturates whilst being packed with both insoluble and soluble fibre, protein and a variety of minerals. A daily portion of beans provides good amounts of both protein and fibre, and these two nutrients prevent food from leaving the stomach too quickly, helping us to feel fuller for longer. All beans help to slow down the absorption of sugar into the blood, making our sugar levels stay even. I used skinless chicken thighs on the bone as these were the only free-range thighs available. This will give more flavour to the chicken but you can just as well use skin and boneless chicken thighs. The boneless ones will cook quicker. 1. Pre-heat the oven to 180C/fan 160C/350F/gas mark 4. Add the olive oil and sliced leek to a casserole dish over a low heat. Stir and fry for about 5 minutes until the leek is soft. Add the crushed garlic and continue to fry for another minute. 2. Add the sherry or wine and increase the heat to medium. Let it simmer until reduced by half – about 5 minutes – before adding the stock, chicken thighs and thyme sprigs to the casserole dish. Season with salt and pepper and bring back to a simmer. Cover the casserole dish with a lid and place it in the pre-heated oven. 3. If you are using chicken thighs on the bone, cook for about 40 minutes, until the chicken is cooked through. If you are using boneless chicken thighs, it will be enough with 20- 25 minutes (just check after 20 minutes). Once the chicken is cooked, lift it out, place it on a plate and cover it with foil to keep it warm. 4. Place the casserole dish on the hob/burner over a medium heat. Add the mustard and crème fraiche to the casserole dish and stir. Check the seasoning. Add the rinsed beans, bring back to a simmer and as soon as the beans are warmed through, add the cooked chicken thighs.